Ledger Line Rules – Confused? Ever wondered how we are supposed to write a Ledger Line? Is it too long? Is it too short? Do you need one above the note? Do you need one below the note? What about when you have a melodic interval with ledger lines? And accidentals? What happens with those? A Ledger Line is simply a special line (or lines) used to extend the range of notes above or below a Staff. 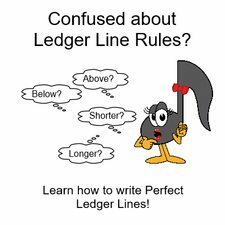 Here are some Ledger Line Rules to make writing Ledger Lines Easy! 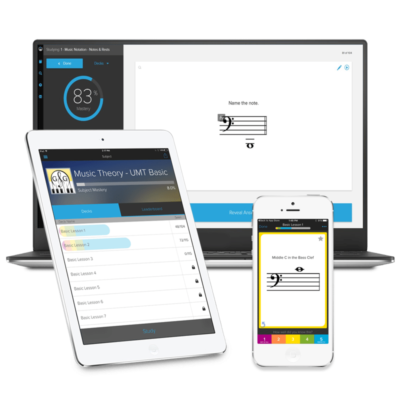 When I mark the Exams from the Ultimate Music Theory Certification Course and the Online Complete Rudiments Course, I am a very fussy marker. I feel that we should always take in pride in how we write music! We are teaching our students to write the language of Music - we need to respect this language and write it neatly. If we don't write our music (including clefs, notes, rests, etc.) 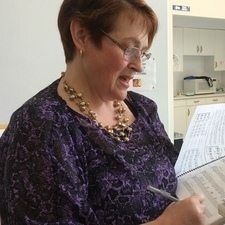 properly, or if we don't know HOW to write our music properly, how can we TEACH our students to write their music properly? BE FUSSY! Embrace the perfectionist in you. And, if you don't know HOW to do it perfectly, ASK ME and I will blog about it! And yes, I love marking theory! This picture is from our last recital - my student (at my suggestion) brought her theory book and worked on theory while "watching" the recital. At the end of the recital, of course I just HAD to mark her theory! I truly do love marking theory! How fussy are you when it comes to marking theory? How fussy are you when it comes to writing theory properly? Let's start with 3 Tips to Draw Perfectly Proper Ledger Lines! Use your UMT Ruler to draw nice, straight lines that are parallel with the staff lines. Keep your Ledger lines an equal distance from the staff (they are "extra staff lines" that are written as needed). Draw your ledger lines the correct length (they should extend slightly past the note on either side). Keeping those 3 Tips in mind, can you identify and explain the Boo Boo in each measure? Oh dear! Where to even begin? The Fussy Marker inside of me has sharpened my red marker! Measure #1 - The ledger lines for both notes are on angles (not parallel). When writing a note on a ledger line, and you skip over other ledger lines to "get" to that note, you must write the ledger lines that you skipped over. Do not write extra ledger lines though. If you didn't step or skip over that pitch, don't add the ledger line! A ledger line note written in a space only requires one ledger line to "sit on" or to "hang from". I tell my young students that the ledger line is a magnet - you don't need 2 of them to make the note stay in place. Keeping in mind that we only use what we need, can you identify and explain the Boo Boo in each measure? This should be easy (but if it is not, please review Basic Rudiments Lesson 1). Measure #1 - You must show the ledger lines that you skip over! Measure #2 - Are the ledger lines needed above the first note and below the 2nd note? Remember - if you don't step or skip over the pitch, don't add the ledger line! Measure #3 -We don't add a ledger line above a note that is sitting on a line, or below a note that is hanging from a space. Remember to KISS (Keep It Super Simple) - one ledger line per (melodic) note. Here are some examples of melodic notes written with ledger lines. Can you identify and explain the Boo Boo in each measure? Measure #1 - For a melodic 1st (melodic unison), do not extend the ledger line. Each note has its own ledger line. Measure #2 - Even for any other melodic intervals, do not extend the ledger lines! Measure #3 - Looks silly, but it's happened! And no, we do not join ledger lines from above the staff to below the staff! Accidentals never touch the notehead! Do not extend the length of a ledger line to go through the accidental. The accidental may touch the ledger line or it may simply be written before the ledger line. Just do not make the ledger line super long to force it to go through the notehead AND the accidental! I tell my students to "use their eyes". If the accidental looks too close or if it looks too far away, then it probably is incorrect. Simply write the accidental slightly before the notehead. Can you identify and explain the Boo Boo in each measure? Measure #1 - Accidentals do not touch the noteheads. Measure #2 - Do not extend the ledger line through the accidental. Measure #3 - Accidentals are not written in outer space!